These are the first images of Vauxhall's seventh-generation Astra, which is being produced at Vauxhall's Ellesmere Port manufacturing plant in Cheshire. 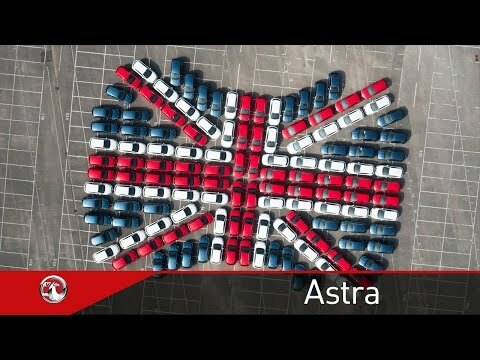 The Astra is one of the UK's top-selling and best-loved cars, and for many years has been a household name for British car buyers with over 2.9 million sold in the UK over the last 36 years with over 50,000 in 2014..
Based on an all-new lightweight vehicle architecture with a new design, powertrains and technology, new Astra will receive its world premiere at the 2015 Frankfurt Motor Show in September of this year. The all-new Astra features a powertrain portfolio including petrol and diesel units ranging from 100PS to 200PS. The highlight of the engine range is the all-new 1.4-litre (150PS) ECOTEC Direct Injection Turbo, a four-cylinder unit from the same family as the one-litre, three-cylinder engine seen in Corsa, ADAM and New VIVA. The engine delivers maximum torque of up to 245 NM between 2,000 - 3,500 rpm. Based on its construction, the new 1.4 ECOTEC Direct Injection Turbo also adds less weight to the car. There's also a 1.0-litre ECOTEC Direct Injection Turbo (105PS) petrol engine and a 1.6 CDTi 'Whisper Diesel' range with outputs starting from 110PS up to 160PS. Inspired by 2013's Monza Concept, the lean design makes the new Astra look more athletic than ever before. Evolution of the Vauxhall design philosophy 'sculptural artistry meets technical precision' ensures that the new Astra catches the eye with a lighter, more agile appearance.The Griffin in the centre of the chrome bar on the grill and the characteristic 'blade' raising towards the rear make the new Astra immediately recognisable as a member of the Vauxhall family. The front headlamps melt into the radiator grille to form a graphic unity. The most significant design cue is the divided C-pillar, creating the impression of a floating roof. The interplay of light and shadow is emphasised by the horizontal crossbar above the brand logo linking the rear lights. The new Astra is the first new Vauxhall model that will be available with the personal connectivity and service assistant OnStar from its launch. OnStar offers customers a broad range of safety and comfort services. If an airbag deploys, OnStar will be alerted automatically. An advisor will then contact the vehicle to determine whether help is required. If there is no response, emergency responders are immediately sent to the exact location of the vehicle. Drivers and passengers can reach OnStar 24/7 and 365 days a year. No matter whether they need roadside assistance or any other service – an OnStar advisor is always ready to help. OnStar also turns the new Astra into a 4G LTE mobile Wi-Fi hotspot. Up to seven devices, from smartphones to tablets, can be connected simultaneously. For more detailed information on OnStar why not have a look at our OnStar page. Making its debut in new Astra is the new generation IntelliLink infotainment system that is compatible with Apple CarPlay. Apple CarPlay takes the iPhone features you'd want to access while driving and puts them on the vehicle's display in a smart, simple manner, allowing drivers to make calls, send and receive messages and listen to music right from the touchscreen or by voice via Siri. The functions can be controlled via the large, up to eight-inch touchscreen located high on the center stack, via remote control on the steering wheel (volume) or via voice control. The Navi 900 intellilink sat nav system provides an eight-inch colour touchscreen with full European map coverage and voice recognition. The system is compatible with Apple Carplay from launch. There's also an 18-way adjustable driver's seat. It has massage function, ventilation and seat-width setting. And the rear passengers can also look forward to more comfort than before with the two heated outer back seats available. For more information on the new Astra, why not contact our friendly and experienced sales team or, visit our new car offers section.